Want to help the environment, create a more sustainable planet AND improve your health? Then sign up for Meatless Monday! Q. What is Meatless Monday all about? A. Meatless Monday aims to educate and inspire citizens to eat fewer animal products – one of the most effective steps anyone can take to address climate change and fight global warming. Meat and dairy, produced intensively as they are today, use large amounts of land and water, produce significant greenhouse gases, and are a major factor in water pollution worldwide. The movement is popular in the US, where an estimated 18% of people are doing Meatless Mondays. Q. Why does eating less meat help the environment? A. The United Nation’s Food and Agriculture Organization (FAO) has concluded that the livestock sector is ‘one of the top two or three most significant contributors to the most serious environmental problems’. Eating a plant-based diet is a far more efficient use of resources, reducing water and land use, pollution, soil degradation, deforestation and greenhouse gases. According to the UN, animal farming is responsible for 18 per cent of global greenhouse gas emissions, more than the entire transport sector combined. Another expert group says the figure could be more than 50 per cent. Eating less meat also reduces your water footprint. The water needs of livestock are tremendous, far above those of plant foods. An estimated 1,800 to 2,500 gallons of water go into a single pound of beef. Q. Why is eating less meat more sustainable? A. According to World Wide Fund for Nature’s Living Planet report, we’re now using the resources of 1.5 planets a year….despite only having one planet! It takes many kilos of plant protein to produce a single kilogram of animal protein. It is a much more efficient use of resources for people to consume plant foods directly. Some estimates say 20 people can be fed a plant-based diet on the amount of land needed to feed one person consuming a meat-based diet. Q. Why is a eating less meat beneficial to my health? A. Most people eat more meat than they need to. Many scientific studies have found that people eating a plant-based diet have lower rates of death from heart disease, lower blood cholesterol levels, lower blood pressure, type 2 diabetes, and prostate and colon cancer. Read The China Study by T. Colin Campbell to learn more. Q. What do I have to do to go meatless on Mondays? A. Find some tasty recipes, buy the ingredients on Sundays, cook them on Mondays! Easy. Recipes – VegWeb.com , Fat free meatless recipes . Alternatively, treat yourself and eat out at one of the Whistler restaurants on our restaurant list. Q. What about fish, milk and eggs? A. To have the greatest impact enjoy recipes that are free from any animal or fish products. Q. 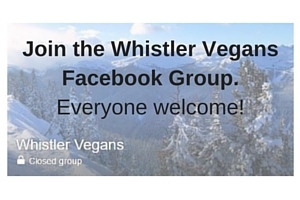 Where can I find meatless meals in Whistler? Q. Where can I find more information and support?